What do empty nesting, Keith Olbermann, a day at the pool, good food, and Lee Daniels’ The Butler have in common? They are all part of this Labor Day grab bag of (relatively) quick observations – because it is still summer and I don’t want to work too hard writing long blog posts! Hopes for Year 3 of Empty Nesting: As of 6 a.m. on Saturday, our third year of “empty nesting” officially began. Candice and I took Claire to the airport for her flight to California. Andrew went back to school about 10 days ago (even though – as you can see below – he is also managing to fit in things not school-related). My hope is that Empty Nesting: Year 3 will be the first “normal” one, following our health problems of the first year and the rehab-focused Year 2. After extensive rehabilitation and a few months of myofascial release, Candice is walking – and feeling – better than she has in five years. In fact, she’s so positive about myofascial release that she turned Claire into a believer and I go on Monday for my first session. We may all be skipping around the house later this year! But permit me one last reflection before ENY3 begins in force. This summer was perhaps the last where both children will be home for the entire three months, if the current plans for study abroad come through next year. As I’ve written recently, it was great having Andrew and Claire (and their many friends) home this year. (A mother told us that the second year of empty nesting was the “bed-and-breakfast” year when the children are home and their friends from college all come to DC for the summer. That was certainly our experience…and we loved it.) With twins and friends in tow we went to baseball games (my passion, not the twins, but they indulged me). We ate prodigious amounts of good food…up to the night before Claire took off for school. Some great finds this year: Eleven and Deluca’s Diner in Pittsburgh; Kapnos, Mike Isabella’s new Greek restaurant in DC; Acqua Al 2 with its great Italian food just steps from Eastern Market; the food trucks at the NoMa film festival; and Pho14, the Vietnamese restaurant in Adams Morgan. We also visited (and revisited) many old favorites, from Surfside in Glover Park, to Jackie’s in Silver Spring to Dolci Gelati in Takoma Park. It was also fun to have the twins pick out restaurants this summer. 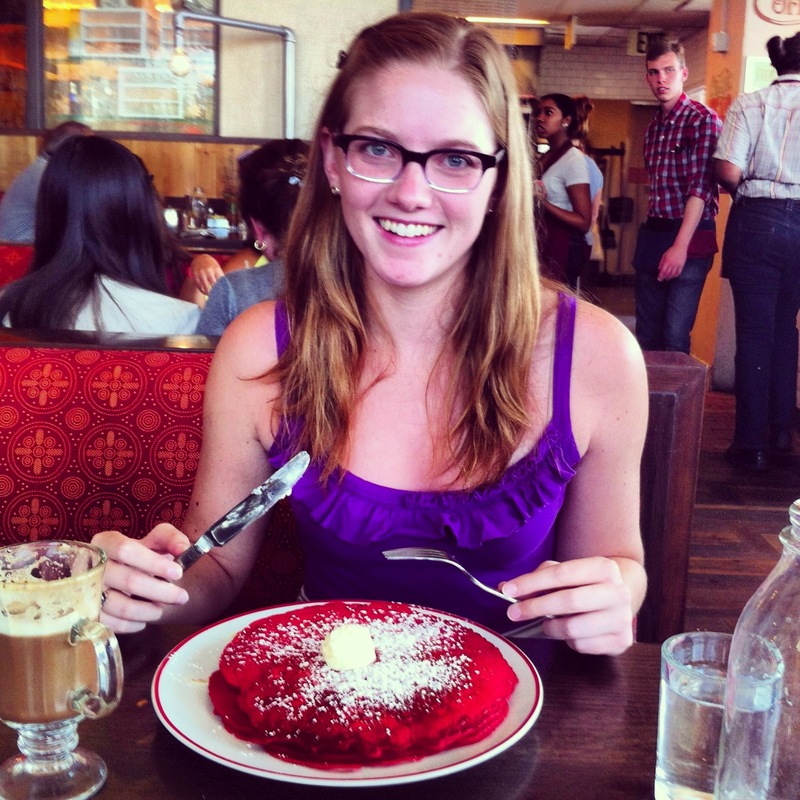 Andrew included four ethnic restaurants as his staycation contribution, and Claire took us to one of her favorites – Founding Farmers – so she could enjoy the red velvet pancakes shown at the top of the post. We also followed Andrew and Claire’s lead in just getting out and enjoying the city. As you can see below, Andrew has carried this forward upon his return to Providence. He sent the following photograph this weekend from the Boston Museum of Fine Arts. 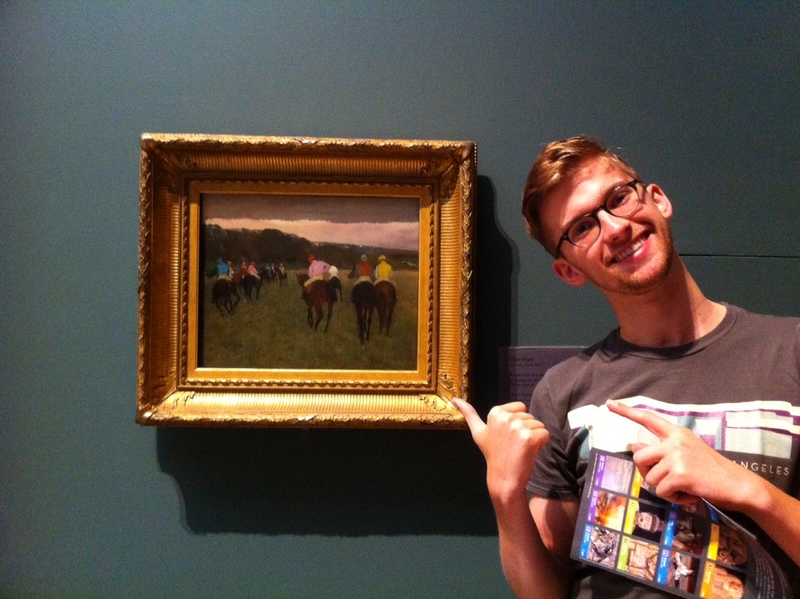 The inside family joke is that Andrew has a poster of this Degas painting, Race Horses at Longchamp, in his room. While we enjoyed our first couple of years of empty nesting, this summer was a wonderful reminder of why we love being around the twins…especially as they grow into adulthood. “Day-to-Day” with Keith Olbermann: I have always enjoyed Olbermann’s unique – many would say skewed – perspective on life. I was a fan of his early SportsCenter days on ESPN, and I also was a regular viewer of his stimulating – and tumultuous – stint on MSNBC. So I was pleased when ESPN signed him for a return gig that began in late August. My first chance to see his new show was last Tuesday, and he didn’t disappoint. Case in point: during the sports highlights he duly noted that an injured player was “day-to-day.” Then, with just the right pause, he added, “But aren’t we all?” I was in a hotel room and laughed out loud. Priceless. Saying So-Long to the Pool: I’ve written before about how our neighborhood pool has been a wonderful part of our family’s summer life for many years. Now that we’re no longer involved with the swim team, I seldom go. (This year, I’ve been twice and both times involved food!) Claire and Andrew taught swim lessons again this summer, and Candice still enjoys the occasional afternoon around the pool with a good book and the opportunity to take a refreshing dip to cool down. But I still relish the Labor Day tradition of saying so-long and was thrilled when the pool hosted a pork barbecue cook-out on Saturday. Candice called some long-time friends and the four of us enjoyed a couple of hours sharing stories, good food, and the sunshine. Summer weekends are made for slower rhythms – if we’re smart enough to follow. Things to Read: As a country, we are destroying the concept of a public good. I wrote about that in a recent blog post on The Unwinding. And in today’s New York Times, columnist Nicholas Kristof takes direct aim at a government that is allowing the trashing of our public lands. Kristof’s best line? What our ancestors were able to create when we were a poor country, we are unable to sustain even now that we are rich. That’s not because of resources. It’s because they were visionaries, and we are blind. The Nats Have a Pulse: When the Nationals finally start playing well, win 8 of 10, sweep the Marlins, and have their fan base excited about the possibility of meaningful September baseball, they lay two big eggs against the woeful Mets. Both Friday and Saturday games were painful, for different reasons. And Sunday looked to be more of the same. But they woke up in the 8th, scored 3, and salvaged a game out of the series. Yes, they gained a game in the wild card race…but they are at 6 1/2 games out which is exactly where they were when the weekend started. Had they swept this series, they would be 4 1/2 out…and we’d really be excited. So I’ll keep watching, but I don’t hold out much hope. The Butler…or Beginning our Oscar Watch: Regular readers know that Candice and I have taken to watching all the Best Picture nominees before the Academy Awards ceremony. The first year we made the decision to do this about six weeks before the show…and we had to catch several movies on the computer screen as opposed to the big screen. Last year we were prepared and kept an eye out for the movies that were generating Oscar buzz as they were released. That worked out well, so we’ve started to pay attention to this year’s films. In that spirit, we went to see Lee Daniels’ The Butler tonight, and both thought it was a strong movie and a certain Oscar contender. Forest Whitaker is a terrific actor and did a great job with the character of Cecil Gaines – the White House butler based upon the real-life story of Eugene Allen. Oprah Winfrey was great as Cecil’s wife Gloria – I felt she owned that part. None of the “presidents” resembled their historical characters, but despite how much that bugged the Washington Post, it really didn’t matter and it certainly doesn’t affect the movie. (To see a different take on the movie than the bad Post review, read A.O. Scott’s piece in the New York Times.) Jane Fonda, in a cameo as Nancy Reagan, of all people, showed she really can act. The stain of racism is America’s original sin. The Butler – dedicated to those who marched and fought to help erase that stain – is well worth seeing. And on this Labor Day, it is also important to remember those black men and women who labored as domestic servants: butlers, maids, Pullman porters. We forget that our labor force has always included African-Americans, Latinos, Asian Americans, and immigrants of every stripe. The Butler reminds us – as we stand in an era where the powerful often denigrates labor – that these individuals also made their invaluable contribution, working with pride and dignity. David, you write so well! And you have such interesting and valuable insights to share. Thank you for this post. I am eager to see The Butler and I am about to go read Nicholas Kristof’s piece RIGHT NOW! Again, thank you! Just adore your blog – Loved your take on “The Butler” and it’s on my list. Don’t miss “Blue Jasmine.” Cate Blanchett may have “Best Actress” locked! Best to you and Candice.